Window Film Factory uses Mactac 798-01. 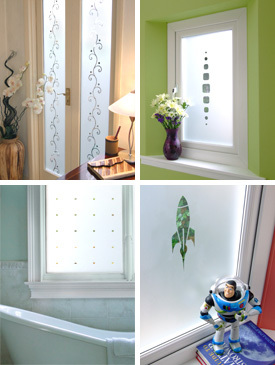 There are many frosted films available, of varying quality, to suit different requirements and budgets. Window Film Factory uses Mactac film, arguably the most visually pleasing and one of the highest performing window films on the market. These use-life estimates are based upon accelerated ageing studies and outdoor exposure, under conditions experienced in vertical exposure and in "normal" temperate climates. Note : Exposure to severe temperatures and ultraviolet light, as well as conditions in southern European countries, and also in tropical, sub-tropical or desert regions, will cause a more rapid deterioration. This also applies to polluted areas, high altitude and south-facing exposure. High quality acrylic solvent based adhesive, very cohesive and extremely durable. (25 cm x 25 cm, sample mounted on aluminium). Resistant to most oils and greases, fuel, aliphatic solvents, weak acids, salts and alkalis. MACal Glass Decor 700 series can be screen printed. Contact screen ink supplier for advice on suitable inks. For an uniform appearance, application by the wet method is recommended. *Can last considerably longer - mactac film has shown to last 16 years (and counting) under UK conditions.